The first two regulated BTC futures were issued by CME and Cboe in December 2017, and more are currently being proposed by Bakkt and Nasdaq. We consider regulated BTC futures important gateways towards increased BTC adoption, as they bring about a number of improvements to BTC’s market quality when listed on their respective exchanges. Firstly, regulated futures provide a trusted path for traditional investors to invest into BTC. Preventing fraud and price manipulation are CFTC’s publicly stated goals in regulating BTC futures. They hence tightened the BTC futures self-certification process in February 2018, one example being the requirement for higher initial margins. The initial margin of CME and Cboe BTC futures are currently set at 47% and 44% respectively, which is at least 10x higher than for CME corn futures. Secondly, this regulatory pressure forces issuers to improve their business processes. We believe that Nasdaq will be able to satisfy CFTC’s market surveillance requirements via SMARTS, a stock market surveillance system which correlates real-time and historical data of BTC. This aids in the detection and prevention of spoofing and wash trading. Apart from SMARTS, VanEck’s MVIS facilitates price transparency by tracking three major OTC BTC liquidity providers, thus mitigate the possibility of BTC price manipulation. Thirdly, the physical settlement of futures creates a need for a robust supporting ecosystem. Bakkt’s proposed physically-settled BTC future is currently being reviewed by the CFTC. It is however worth noting that the CFTC has not yet approved any BTC futures with physical settlement, as these are consider more susceptible to price manipulation (compared to cash settlement futures). We further believe the protection of physically-delivered BTC against thefts and hacks to be of concern to the CFTC. The chance of approval for physically-settled futures will be significantly higher if qualified custodian solutions exist in the market to support future offerings. We thus believe that regulated BTC futures may improved the BTC market quality via enhanced market transparency, liquidity, and trust. As noted in our chart of the week, the demand for BTC futures has remained relatively strong despite the bearish 2018 market. 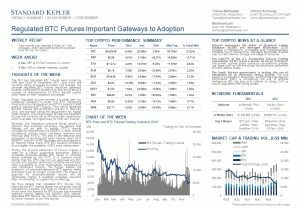 Regulated BTC futures may provide a trusted gateway for more investors to join this market.